Most of my family lives in Wisconsin. Besides the Packers, Wisconsin is known for their beer, brats, and cheese. 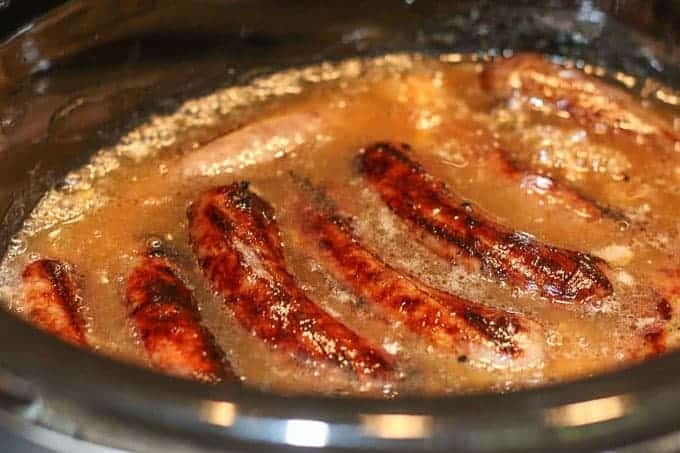 In this slow cooker beer brats recipe, I am going to teach you the tricks I have learned on how to cook the most delicious crockpot beer brats and onions you will ever make! I was fortunate again to be asked to write an article for City View Magazine in Fayetteville, NC. It is such a beautiful magazine and it is so exciting to have an opportunity to see my recipes and food photography in print! I was asked to create recipes cooking with wine and beer for their Food & Wine Issue. This was such a fun article to write. I included this Slow Cooker Beer Brats and Onions recipe, my Port Wine Cheese Ball, and Easy Cheesy Jalapeño Beer Bread Recipe. Wisconsin natives have their own tricks to making the perfect brats. Some people cook them in beer and onions before grilling them and others grill the brats first. I prefer grilling my brats first to lock in the crispy skin. 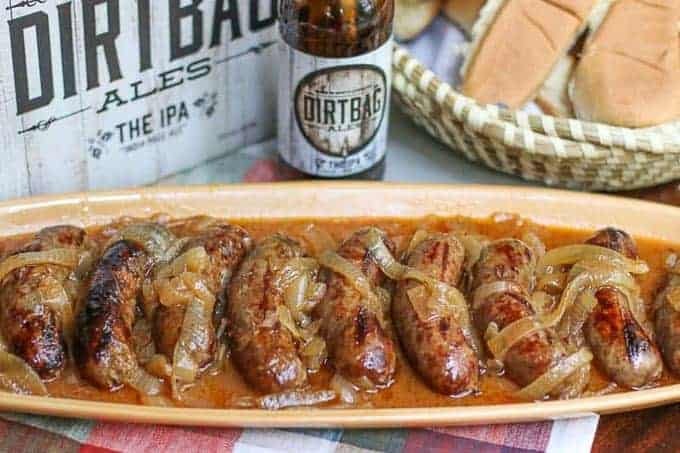 I then cook them in my slow cooker long and slow in my beer sauce to let the brats and onions absorb that amazing beer flavor. My family is from Wisconsin. The native people are known for their love of cheese, beer, and brats. 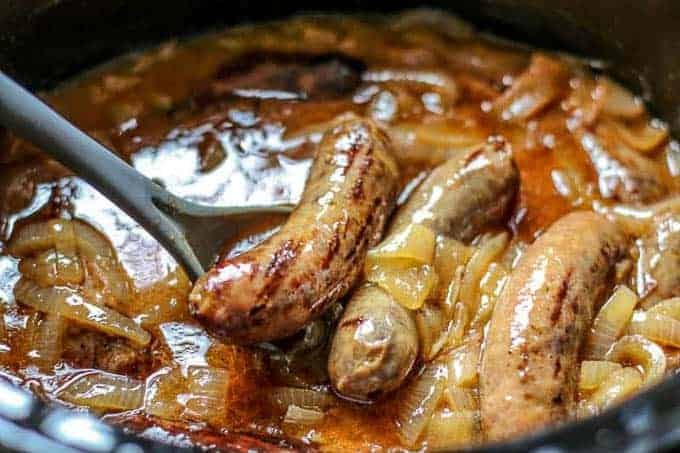 In this recipe, I am sharing with you tips on how to make the best slow cooker beer brats with onions recipe you'll ever have. Slice onions into thick rings. Sauté onions in butter until softened, but not completely cooked. Do not caramelize. In a mixing bowl, combine barbecue sauce, Dijon mustard, and hot sauce. Mix well. Pour barbecue sauce mixture over onions and mix well. Grill Brats about 3 minutes on each side to crisp the outer skin. 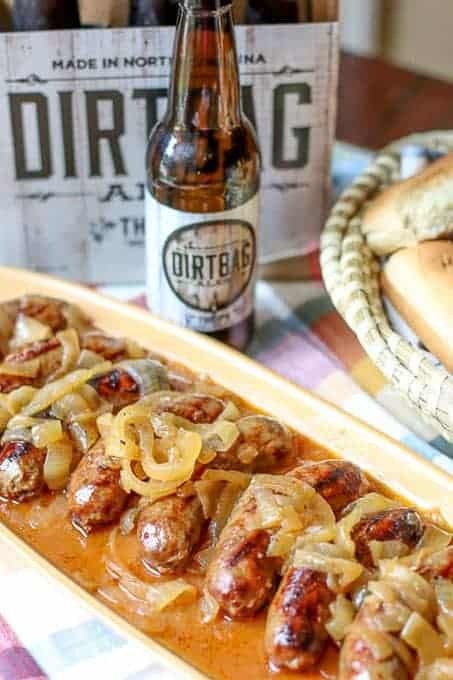 Pour beer over onions and brats. Cook in Crockpot 6 to 7 hours on low. I am so glad you liked them!! That is great. Thanks for sharing. Made these for an Oktoberfest-themed retirement party, and I ended up handing out the recipe to several people (including the retiree, who said he’s never had brats this good)! I used a Sierra Nevada Oktoberfest the first time around, and now I’m trying a Bohemian Pilsner. What a great recipe! Wow! There is no way 40 will fit in a crockpot. I actually have 2 crockpots, so if you could cook split half and half into 2 crockpots, that would work. Otherwise, I would get the biggest foil disposable pan that will fit in your oven and cook them in the oven at 400. You can follow the same recipe, but as for the amount of onions and sauce, I would use about 9-10 onions, 3/4 cup butter, 3 beers, 1 1/2 cup barbecue sauce, 3/4 Dijon mustard, and 1 tbs hot sauce. If you want a strong beer taste, go for 4 beers. If you cook them in the oven, grill them first, then add them to the onion mixture, cover tightly, then cook about 30 minutes. Remove from foil, flip the brats and cook about 30 more minutes. Hope this helps. These look delicious! I’d like to try this recipe since I’m making brats for a large crowd. Could I use this recipe to make 40 brats? Will I have to cover them with beer or will they steam? Awesome!!! after 6 hours in crockpot threw those puppies bac on grill..shared with friends definitely double next time? I would think so. I haven’t tried to half it personally because I usually make it in a big batch to share with friends. But I can’t imagine it not turning out just as good halved. Can you half this and it come out as well? If this isn’t comfort food, I don’t know what is! Looks so good, especially when paired with a beer 😉 Pinning! I know hubby would really enjoy this too. Congrats on the publication! That’s so awesome!!! Sooo delicious! This kind of eating can make my heart sing with joy:) Cannot beat a good beer sauce. Especially when talking brats. Cheers Katie!